Why do we play arcade games for hundreds of hours? When George Leutz was a kid, long before he completed the most epic Q*bert game anyone has ever played, he dreamed of climbing a pyramid without end. The pyramid was gold, and it had a central staircase, and it looked kind of like Gozer the Gozerian’s temple at the end of Ghostbusters. He had the dream only once, 25 years ago, but he can still describe it in exacting detail. He remembers how he couldn’t see the top or the bottom of the pyramid, and he remembers how he thought about walking down but then chose to climb straight up, and he remembers how eventually his view pulled back into a wide shot until he was not much more than a speck, and still he had no sense of where the whole thing began or ended. Leutz is 38 years old now, skinny and affable, with clavicle-length brown hair and glasses. He walks dogs professionally on the Upper West Side of Manhattan and plays guitar (as well as the theremin and pan flute) in a band called Crowds and Power, and the dream is one of the first things he brings up when he sits down with me at a tavern/arcade called Barcade, in the Williamsburg section of Brooklyn. We are at a table in the back, mere feet from a Q*bert machine that he has played hundreds of times before and has no intention of playing again anytime soon, not for a long time if he can help it. 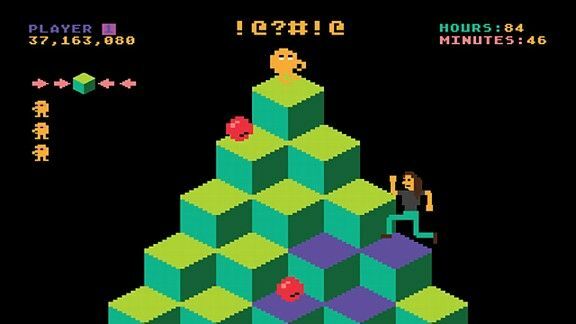 Four times over the previous two years, Leutz tried to break the all-time Q*bert high score of 33,273,520, a record set three decades earlier by a Canadian named Rob Gerhardt, who, oddly enough, can’t even remember doing it. Four times, Leutz failed. He was derailed by a lack of sleep, by a lapse in basic motor skills, by all the things that you might imagine would interrupt a three-day marathon of anything at all, let alone a task that requires a deep reserve of hand-eye coordination. He was also stymied by at least one hazard he could not have foreseen: After 36 hours of gameplay in one go-round, his friend Ed, the guy everybody calls Ed the Human Kill Screen, tried to be helpful by unplugging a noisy machine nearby, and in so doing accidentally bumped the Q*bert plug out of its socket. Those failed attempts left Leutz numb and frustrated, but he found he could not stop himself from trying again. And so on Valentine’s Day, at 11:52 in the morning, he sat down on a stool at the Q*bert machine at a suburban New Jersey arcade owned by a punk-rock musician who goes by the name of Richie Knucklez. This time, Leutz had researched sleep patterns on the Internet, studying something called the Uberman schedule (during past marathons, when he rested on an air mattress in the center of the arcade, Richie Knucklez stood over him and watched his rapid-eye movement to measure the quality of his sleep). He did not pull back on his diet or fast leading up to it, as he had done in the past, for voiding-related reasons. When he got hungry in the evening, he ate a roast beef sandwich, and he used no caffeinated stimulants other than tea from the deli next door. He played for 16 straight hours, building up 600 additional Q*berts, and then he ducked under a Roller Disco pinball machine, set his iPhone alarm for 30 minutes in the future, laid his nest of hair on a pillow, and took a nap. Soon after toasting the high score with a glass of champagne, he felt a sore throat coming on, took another nap, and when he woke up he’d forgotten everything about how to play. “I think I want to stop,” he said, and the people around him assured him that the man in Florida was still going, so he had to keep going, too. He walked outside into the cold, cleared his head, and soldiered on. He figured he might last another three hours. He went another 10. He started seeing things: His Q*bert appeared to be at the center of the screen, no matter where he actually was; the pyramid appeared to tilt to the right. When he passed 30 million points, Ed the Human Kill Screen mimed like he was going to unplug the game again and their mutual friend, a guy they call Freako, threatened to cut off Ed’s hand with a ninja sword he keeps in his car. Leutz’s guilty pleasure is conspiracy theory, and at one point deep into the third night he began to think the game was actively plotting against him — he called it his “Evil Kirk” moment — and when he broke through the 75-hour mark he started to wonder if he might be summoned by the Illuminati. Through it all — 84 hours and 48 minutes — Leutz continued to alter the colors on the pyramid, to maneuver around enemies whose descent was controlled by a random algorithm stored within the decades-old hardware. His game was being live-streamed online, and he could hear people talking to him, though if he tried to speak back to them he lost his ability to focus on the screen. They told him that the man in Florida was still on his heels, that he had to keep going or risk losing everything. And so Leutz kept on hopping from square to square, having no real control or understanding of the urge that had driven him to do this, knowing only that if he succeeded, he would never, ever have to do it again. Leutz grew up in the Canarsie section of Brooklyn and went to Queens College for a year before dropping out to play in rock-and-roll bands. His father used to take him to arcades in the city and on the Jersey Shore, and it was there that he discovered Q*bert, one of the few games that, as a prepubescent kid, he could sustain for more than a few minutes on a single quarter. Around the time his father died in 2009, he watched the documentary The King of Kong on YouTube, and, driven by nostalgia and a need for escape, he started hanging around at Barcade. When he set the establishment record by playing Q*bert for four hours, the guy who’d held it before him came back and played it for eight. It was a watershed moment for Leutz: He could give up, or he could double down. He went back to Barcade and stayed on the Q*bert machine for 12 hours; his name is still up on Barcade’s high-scores chalkboard. Soon he befriended the newest Donkey Kong champ, a plastic surgeon named Hank Chien who also uses Barcade as his home base. And before he knew it, he found himself a part of the inner circle, hanging around at events with the stars of The King of Kong, including the flamboyant Billy Mitchell2 and the longtime arcade gaming “commissioner” Walter Day, who is best known for wearing a referee’s shirt and had an animated character based on him in the Disney film Wreck-It Ralph. This is the weird thing about the field of classic arcade gaming: Thirty years after its heyday, thanks in large part to The King of Kong‘s grassroots success, it is more of a media phenomenon than it ever was before, and yet it remains a black hole of organizational disarray. There are dozens of documentaries in and out of production (Day says he’s been featured in at least four and appeared in maybe five others), and ongoing talk of a reality series. And yet until a few weeks ago, Twin Galaxies — the organization that Day established from his long-defunct arcade in Ottumwa, Iowa, meant to catalogue high scores for the Guinness Book of World Records — was essentially rudderless.3 Now Richie Knucklez — who will soon star in his own documentary — and two other arcade owners have taken it over, with the idea of once again establishing it as a legitimate record-keeper based on video-streaming of all attempts, and somehow unifying the disparate arenas and inscrutable personalities that make up the gaming universe. In the past, that’s primarily involved the verification of high scores, which have long been the standard for gaming success, and which, in the era before streaming video, often invited cheating and outright fabrication. But what Leutz and others have pursued recently is becoming a fledgling genre of its own, an extremist extension of the quest for the high score, a revival of an idea that was explored in the heyday of the arcade but was never really perfected: the notion of playing a video game for as long as you possibly can, on a single credit, until you either run out of men or your body won’t allow you to continue. Until Leutz made his run, the so-called “Holy Grail” was 72 hours. There was a sense, among the old guard, that making it through the depths of the third night — that 4 a.m. stillness that Day refers to as the “valley of death” — was a near-insurmountable barrier. But even post-Leutz, there remains uncharted territory to explore: The still-unachieved goal, the sound barrier of marathon gaming, is 100 hours. It is a number being pursued by a select group of obsessives and thrill-seekers who insist that it is within reach, who both compete against each other and encourage each other, like a sedentary iteration of The Right Stuff. It is becoming serious enough that Day expressed to me his concern about the potential use of performance-enhancing drugs to reach that goal. And the central question this whole movement seems to raise — the reason why, after Leutz’s accomplishment went viral, public opinion seemed divided between ridicule and astonishment — is whether playing a video game might be a legitimate method to gauge the limits of human potential, or whether men like Leutz, in a desperate quest to achieve a brief flash of immortality, are merely devising creative methods for stretching the boundaries of frivolous human preoccupation. And now that he’s started, he cannot stop: His primary obstacle seems to be finding the vacation days, which would include time enough to recover and safely fly a commercial airliner (that may require as much as a week off). In February, going head-to-head against Leutz, Heemskerk made it 63 hours before his brain gave out and the pyramid became an arcane polyhedron and he quickly burned through his reserve of extra Q*berts.5 On a previous attempt, he made it to 56 hours, and then a major thunderstorm rolled through his area, and the colors on the pyramid began changing arbitrarily, and Heemskerk thought he was hallucinating before his wife said she saw the same thing. Eventually, the machine shut down, and his game ended. He was relieved, and he was frustrated, but oddly, he was not angry; maybe extreme exhaustion doesn’t permit much room for anger, because Leutz told me he mustered no anger at all when Ed the Human Kill Screen bumped his plug.6 Instead, feeling wired and harboring a nagging sense of incompleteness, Leutz stayed in the arcade and played some other games before going home. Until Heemskerk made it to 68½ hours, the all-time marathoning record dated back to the summer of 1985, to an event known as the Twin Galaxies Iron Man Contest. It was held at an arcade in Victoria, British Columbia, and organized by Day, who contracted with an insurance company that worked to guarantee hole-in-one contests at corporate events, offering $10,000 to any player who could make it to 100 hours. No one came close; the winner was a Californian, James Vollandt, who made it 67½ hours on a medieval-knight-on-a-flying-ostrich enactment called Joust, though this record remains in dispute, since Vollandt’s game actually reset at one point. Some games, the early marathoners learned, were impossible to marathon for extended periods because of software glitches; others required so much focus, or allowed so few extra lives, that at least one participant simply gave up early on, figuring he would only drive himself mad. Vollandt sat in a director’s chair and wore weight lifting gloves on his hands and a pair of sunglasses to keep the glare from affecting his eyes; there were rumors that he huffed freon to keep himself awake, though he’s denied them. He tells me his doctor has given him the green light; he tells me his wife is onboard, too, if only because it keeps him out of trouble, just as it did when he was an adolescent. He tells me he’s doing it in part to prove that life does not end at 50. He’s made it up to 48 hours so far — he got to 51 as a younger man — although when he passed 40 on a recent attempt, the colors on the board became fluorescent, and then the robots appeared three-dimensional, and he “knew it wasn’t real, but I rather enjoyed it.” The next time he wore an eye patch and switched it from one side to the other every half hour, and the hallucinations went away. There are millions of us who came of age in video arcades — for me, it was a dark and smoky cavern called Playland, which clung to life until the mid-2000s and was essentially the only teen hangout in my small college town — and as we approach middle age, it is only natural that some of us would turn back to those games as a way of clinging to the past. And it is only natural that certain people, staring midlife crises in the face, would turn back to these games as a way to have their names immortalized in the Guinness Book8 without courting certain death or potential embarrassment. I still get an involuntary adrenaline rush when I walk into a place like Barcade, because I remember the freedom the arcade afforded when I was 12 and my parents would leave me behind with $3 and three hours to kill, and how I had to stretch every quarter to pass the time effectively. I imagine there’s a little of this residual feeling behind the marathoning trend, too — that they are doing whatever they can to stretch their metaphorical two bits to the absolute limit. And maybe the Internet commenting trolls and skeptics are right, and maybe that’s all this is, a desperate attempt to turn back the clock, and maybe any attempt to glorify it or glamorize it or turn it into something more than a man engaging in youthful indulgence is an exercise in self-delusion.9 But what if it’s just because we’re seeing it all wrong? What if we were so inculcated, as children, into the notion that video games are inherent wastes of time and energy that we simply don’t want to believe that they, too, can lead to a kind of spiritual enlightenment? What if even a man playing Q*bert can reveal something essential about the limits of the human will? When Leutz’s accomplishment went viral, Jimmy Kimmel did exactly what you’d expect a late-night comedian to do when faced with a story about a scraggly guy who’d just played Q*bert for 84½ hours: He showed a photo of Leutz wearing the googly-eyed glasses that he’d brought along as a lark in case he broke the record, and then he dashed off a one-liner about Leutz simultaneously accomplishing something without accomplishing anything at all. It was a good joke, and Leutz appreciated it, because it carried a spiritual resonance that reminded him of the Tao Te Ching: It inadvertently hinted at some deeper truth. Can you coax your mind from its wandering, the Tao asks, and keep to the original oneness? Can you cleanse your inner vision until you see nothing but the light? Leutz is not a religious man — toward the end of his run, he made a joke about thanking the devil, just to rile up any Christians who might be watching the live stream — but there were things that happened in those final hours that he could not explain. He kept feeling a presence over his shoulder, and he’d look back and realize no one was there. He had a strange sense of gratitude, for his friends, for his support system, for the realization that, unlike Ed Heemskerk in Florida, he was not doing this alone in his garage. He felt his play actually getting stronger in the final hours. In that moment, he was no longer a speck on a staggeringly high pyramid; in that moment, he felt like he was accomplishing something significant, even if it was a narrow task in a narrow subculture that might not amount to anything in the grand scheme of human existence. It was, he told me, similar to the psychologist Abraham Maslow’s notion of peak experience: It was an entirely atheistic religious awakening. As I sat with Leutz at Barcade, a couple people came up and shook his hand. The bartender bought him a round. I asked if he might someday go after 100 hours on Q*bert, and he assured me there was no chance. Then he pointed to the corner, to a game called Gauntlet, a four-player fantasy title involving elves and wizards that I adored as a kid. I’d completely forgotten it existed, and I felt a rush of nostalgia just looking at it and realized how much time I’d killed playing a game that had been effectively wiped from my memory. He told me he was thinking of trying for 100 hours on Gauntlet, because it was easier, because it wouldn’t weigh his psyche down like the geometric strain of Q*bert. He wasn’t entirely sure if he was serious; for now, it was no more than the nascent stirrings of a compulsion. He’d give it a couple years and see if he still felt like he had to do it. Others have played longer on home-gaming or console systems, which allow pausing and/or reclining. Most of the gamers I talked to insisted Mitchell was unfairly portrayed as the villain in The King of Kong, but they also agreed that it was a tremendously entertaining film. Day sold the site in 2008 and went into semi-retirement to pursue a music career, though when I called him, he was working on a set of classic arcade-gaming trading cards. Another Q*bert player, Rick Carter, made it to 59 hours in 2011. He’d actually started his marathon several hours after Leutz began his, and ran out of men 45 minutes before Leutz did, but Leutz’s “coaches” didn’t tell him that Heemskerk had given up until Leutz was finished. This mishap actually became the inspiration for a scene in Wreck-It Ralph. In case you’re wondering — and in most cases, this is the first question people ask — he would “have to be near a bathroom or wear an apparatus,” and employ some fearless soul to replace the bag that the apparatus would empty into. Guinness and Twin Galaxies have historically had a synergistic relationship. It is worth noting that a number of rising arcade-game players were not yet born during the Reagan-era boom: A top Donkey Kong contender is only 21, Scott Patterson told me, and a teenager, Elijah Hayter, has marathoned for 48 hours on Track & Field.